Over the last few years, one of the growing trends in scholarly publishing is the use of Altmetrics to help determine a paper’s impact. Altmetrics gives one the ability to see the number of citations, mentions on social media, downloads from a publisher or repository, captures in online reference managers, and mentions in the news. All of this together tells the story of a paper’s real world impact. At some universities faculty are including Altmetics in portfolios, grant applications, and anywhere else that scholarly impact plays a factor. Recently, PlumX Metrics, a tool for showing Altmetrics, has been added to Dominican Scholar. If you have paper in Dominican Scholar you can look it up and see its impact beyond the download reports that you’re currently receiving. 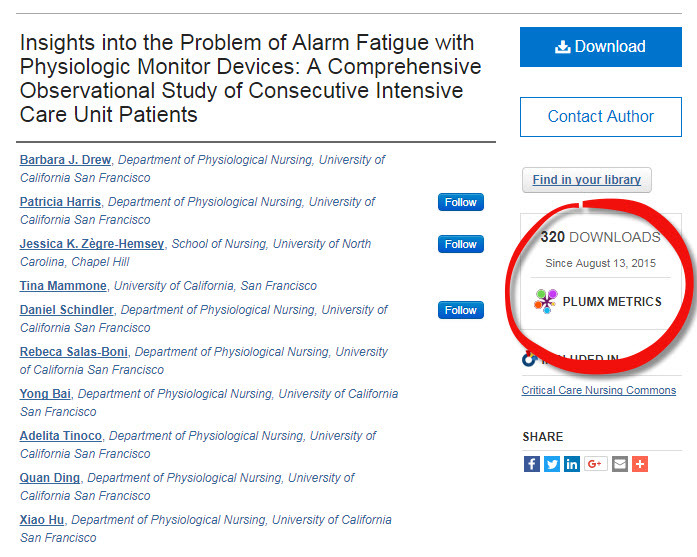 For example if you look at the paper Insights into the Problem of Alarm Fatigue with Physiologic Monitor Devices: A Comprehensive Observational Study of Consecutive Intensive Care Unit Patients co-authored by Patricia Harris, in the Department of Nursing, you’ll see the PlumX Metrics icon on the right side of the screen. You can also see more information like the actual tweets, blog entries, news stories and more. This service is available to all documents on Dominican Scholar, including faculty and staff scholarship, master’s theses and other student authored work.